Brand new, Melitta JavaJig, 63228. 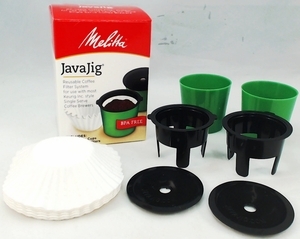 JavaJig is a reusable coffee filter system for use with most Keurig style single serve coffee brewers. Includes: 2 reusable cups & 30 coffee filters.